As promised ... i'll post up Gokujou Seitokai screenshots till Ep14 ba ... hehehehe, that means 7 more eps to go! Here's Ep7 screenshots! LoL, Mayura's ep lol. She ... is dressing up and stuff, going out for a date. LoL. Then the rest of the Gokujoi Seitokai were talking about it and stuff. Then Pucc-chan was kinda saying that the guy Mayura's seeing might be a baddie after Mayura's or rather Gokujou Seitokai's money lol. Haha then they think of many scenes of Mayura being dumped and stuff haha. But nevertheless, they are still worried about Mayura so they went to check after her and stuff. Woo hotbath scene! LoL. Nothing much. 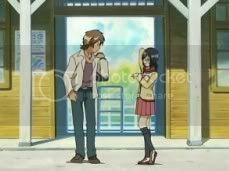 Juz Rino chatting up with Mayura aha. Then as expected, the guy Mayura's seeing's a baddie lol. Nanaho and Kuon were chatting ... on the rooftop woo ... nice scene. 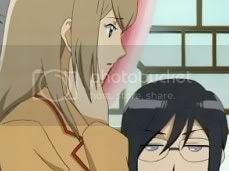 LoL, then the whole Gokujou Seitokai except Mayura and Kanade went to ... uh persuade the guy Mayura's seeing. 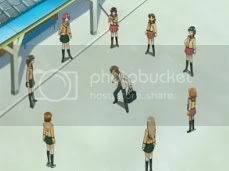 Lol, first up, Kaori ... she couldn't stand the guy and whacked him haha. 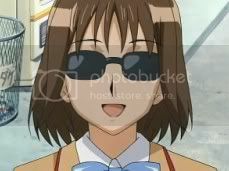 Next up, Seina LOL, she's so funny, she wore this sunglasses LOL [See screenshot 3] she went up to the guy and asked him to break up with Mayura ... the guy juz plainly said no and Seina said, I see and told the rest, it didn't work LOL! Hahahaha. Third, they decided to use LOL!!! romantic overtures! LoL, means using beauty to seduce ba! And they sent Sayuri out!!! LOL Then Sayuri was like posing and making this 'Ohuu, Ahaa, Ehee' noises LOL!!!!!!!!!! The guy juz looked at her and said, 'Don't spread your cold.' LOLLLL!!! Fourth, Cindy LOL, she went up and didn't said anything LOL. Then, Rein went up lol and got mistaked as a kiddie LOL. Last, Rino went up and ... kinda asked if that guy like Mayura then blah blah blah. Yeah, at last, they kinda bashed him up? LoL. 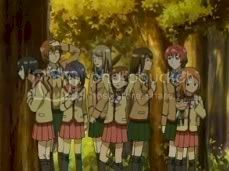 Yeah Mayura was talking to Kanade about helping Mayura's friend to look up the guy the Seitokai thought was Mayura's boyfriend and stuff. So it means that the Gokujou Seitokai had mistaken la, Mayura wasn't going out with the guy afterall, she's just helping her friend to check out the guy. Kanade was like, why didn't you tell us sooner and stuff ... friends will help each other and stuff meaning ba. Haha. Then the guy came up and was like reading a script LOL hahaha 'breaking' up with Mayura. Yeah happy ending anyways. Everyone was being so nice to Mayura sia lol hahaha. Ah, i slacked so much today, i didn't do anything at all, except now, blogging lol. I slept till 11am ... had breakfast ... fried rice, it was nice heh. Hmm, then i realized there's no more One Piece so i switched over to Channel U and watched SuperStar repeat again. Manz, i love XinHui's voice alot, she's so good! I really like the last song she sung, VERY GOOD, VERY TOUCHING and so talented. I almost cried. I love the part where she suddenly was so hyper then went down to soft and mellow voice ... soooooo ... perfect! I never heard of the original singer sing before ... yeah and she IS better than Kelly in terms of voice and control. Sigh. Oh, i'm going to watch The Apprentice le ... 10.30pm then start ha cos of the National Day Rally ... i watched for 45 mins then i went to bath ... hahah then i blog le ... hahaha, later after watching The Apprentice i'm going to watch Gokujou Seitokai Ep8 and Ep9 ba ... ehhh ... hahaha. PS: .... off to watch! !